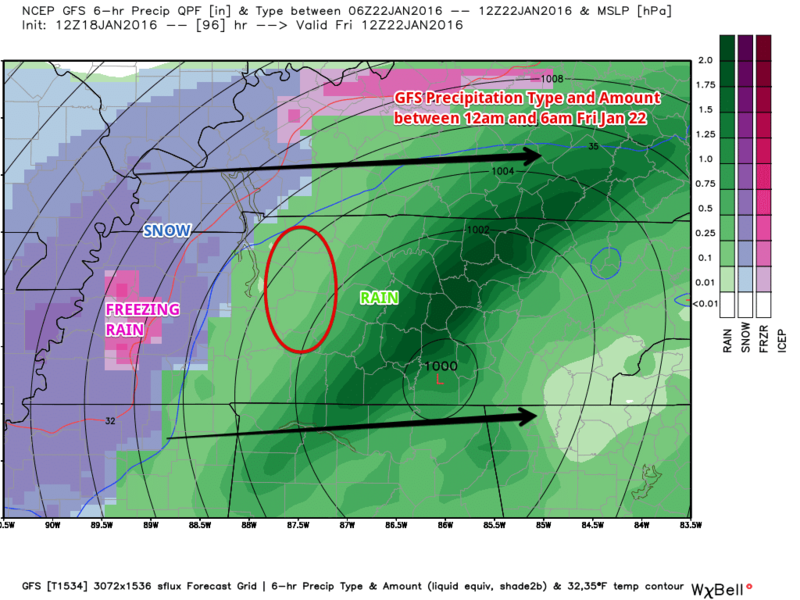 Summary: Several chances to see some wintery precip this week. Pair that with very cold temps and it’s going to be a wild winter ride this week. There’s going to be several chances to see wintery precipitation this week as two different systems move in mid week and end of the week to give us some possible chances of seeing more than just rain. Word of caution: The Web is famous for blowing things out of proportion. So be cautious of any snow totals given. Even weather models tend to blow things out of proportion too. So while the Web may be saying “4-6 inches of snow,” it’s not likely that will happen. Before I get into those winter shenanigans, let’s go through the week day by day. Today, our temps will likely never reach above freezing despite the plenty of sunshine we will see. High temp will be about 26 degrees. As of this writing it is 18 degrees outside under sunny skies. Winds will be out of the north at 5 mph, making things feel just a bit colder than the temperature leads you to believe. Tonight’s overnight low will drop to single digits, with most of us seeing an overnight low of about 9 degrees. This is the lowest we’ve seen this winter so far, so be sure to take care of your outdoor animals (bring them inside if at all possible). Leave your faucet in your kitchen to a slow drip to keep your pipes from freezing. Also, be sure to check on any elderly to make sure they have properly working heat. NWSNashville has issued a Special Weather Statement concerning the very cold temperatures. Temperatures will rebound slightly with our high temperature possibly reaching the freezing mark at 32 degrees. Clouds will start to roll in ahead of our next weather system. Winds will be 5 mph out of the east. Tuesday night, our overnight temperature will drop to about 26 degrees. We will also see a 30% chance of seeing some sleet and snow after 3am. Winds will pick up a bit overnight to 5 to 10 mph out of the east, but then coming from the south as the night moves on. Wednesday is when we will see our first chance of winter weather. Wednesday’s high temperature will reach about 35 degrees, with an 80% chance of seeing precipitation. What kind of precipitation is the tricky part. Right now, NWS is saying there’s a chance of snow and sleet before 9am, then change over to freezing rain and sleet between 9am and noon, then all rain after noon. If you aren’t sure what the difference is between freezing rain and sleet, the chart above will help you out a bit. Which one is worse? Freezing rain. Freezing rain starts off as snow way high up, but falls through some warm air melting it. It then falls back into cold air but through enough cold air for it to become ice again. It then falls to the frozen ground, freezing on contact. 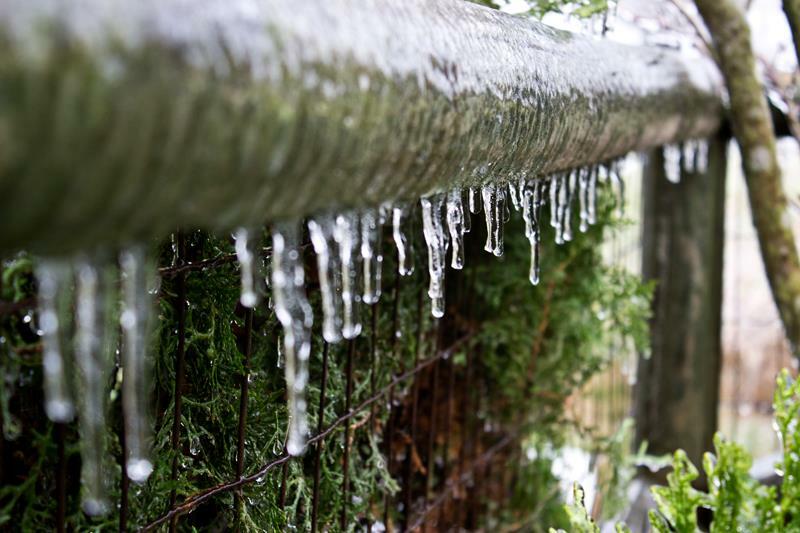 The below pictures are examples of freezing rain. I took these back in the ice storm of January 15-17, 2013. 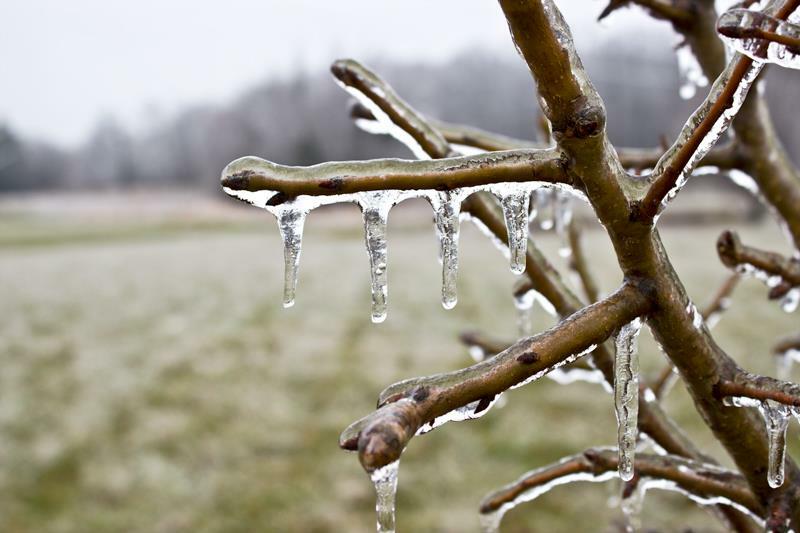 Freezing rain is also mostly what made last year’s February ice storm so bad, as it came down as rain and froze when it hit the ground, roads, and other things like power lines. We could possibly see every form of wintery precipitation on Wednesday, starting with snow and ending with rain. 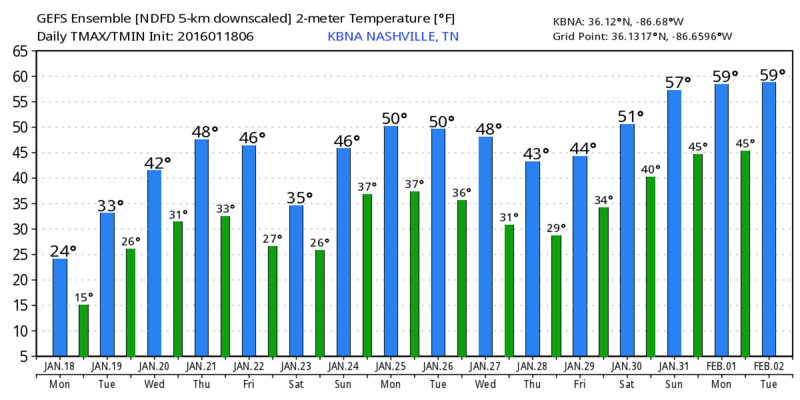 This is because temperatures will start off below freezing when the rain gets here, but then warm up to above freezing when it gets ready to depart. The GFS model is showing the freezing line really close to us around 6am in the morning when some precipitation is expected. This is the GFS model predicting snowfall accumulation between midnight and 6am Wednesday. The red squiggly line you see is the freezing mark line. 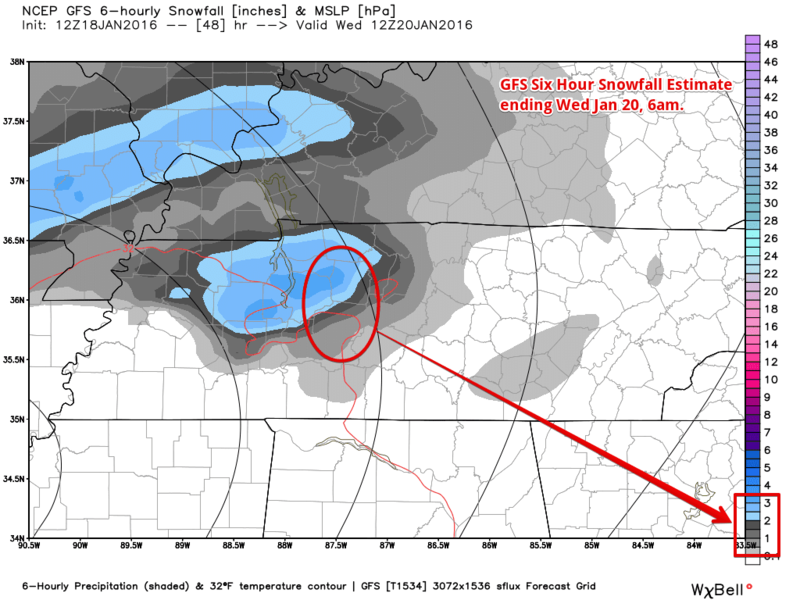 This GFS seems to be a little aggressive in the snow amounts. And this is very likely not all going to be snow. That red squiggly line is very close to us, meaning we could see snow, sleet, freezing rain or rain depending on exactly where the freezing air is in place. GFS also shows this freezing rain/sleet/etc., basically explaining that we could see any of them during the midnight to 6am time frame. This is only one model, but the Canadian model tends to agree that we will get something in the range of freezing rain or sleet. The European model has the freezing line north of us, meaning it thinks we will see rain, but it is still too close for comfort. Things should warm up though by afternoon hours to help melt any winter precipitation we will get, and change over what we do get to rain. Wednesday morning travel could be rough, but with temperatures warming during the day, most of that will be alleviated by mid afternoon. 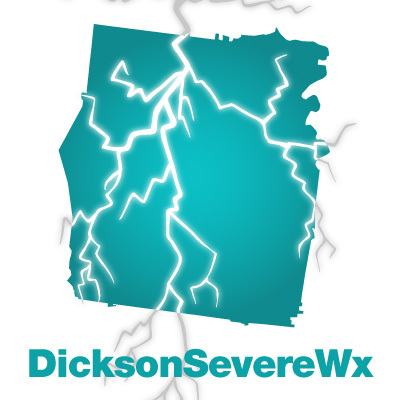 NWSNashville has issued a Special Weather Statement saying that Wednesday morning could be hazardous when driving. FREEZING WEDNESDAY AFTERNOON AND MELT ANY ACCUMULATED ICE. The rain will mostly be moved out of here by Wednesday night, leaving us a 20% chance of rain and the overnight low temperature only dropping a degree but still being above freezing at 34 degrees. Thursday, rain picks back up as we see temps rise to about 46 degrees. Rain chances go from 20% back to 70%, but this time we anticipate it being rain as the temps will be a good 10 degrees above freezing. Thursday night rain continues as chances go up to 80% with an overnight low temperature hovering just above freezing at 34 degrees. Again, only think rain will happen here. Friday our high temperature will only climb to about 37 degrees. We currently have a 50% chance of snow for Friday. Unlike Wednesday, the temperature will actually go down during the day on Friday, so the system starts with rain then transitions into snow. 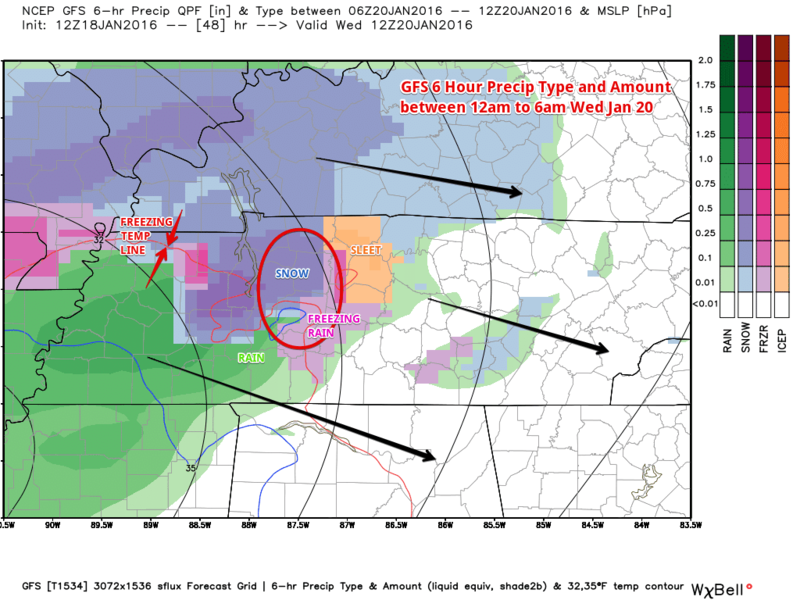 Here’s the GFS model starting us off with rain overnight. 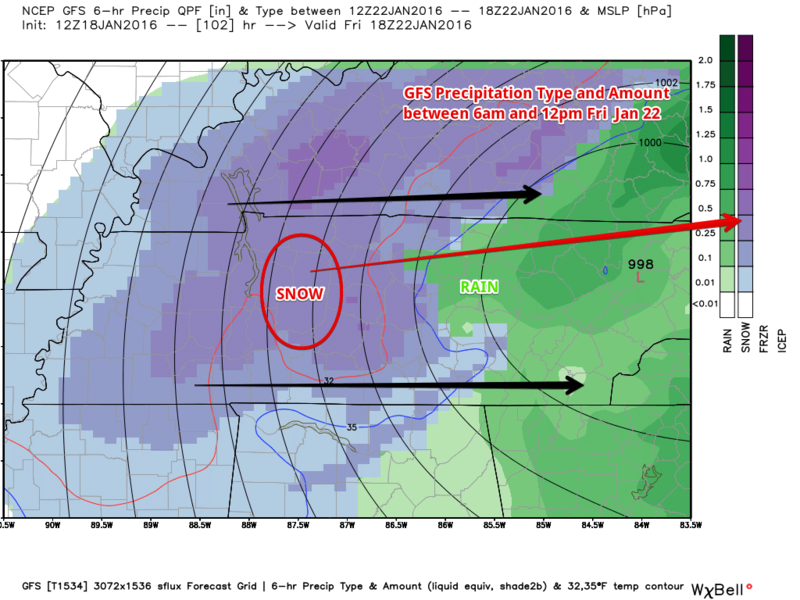 The the GFS thinks the morning to noon timeframe we will see the transition over to snow. There’s no point in posting snow totals right now since this system is more than 5 days out and the models will change many times between now and then. But this is looking hopeful for those who want to see some of the white stuff. We’ll keep you updated on this site and on Twitter as to what we see as we progress through the week with the system on Wednesday and Friday. Previous Previous post: Thank you for an amazing 2015!